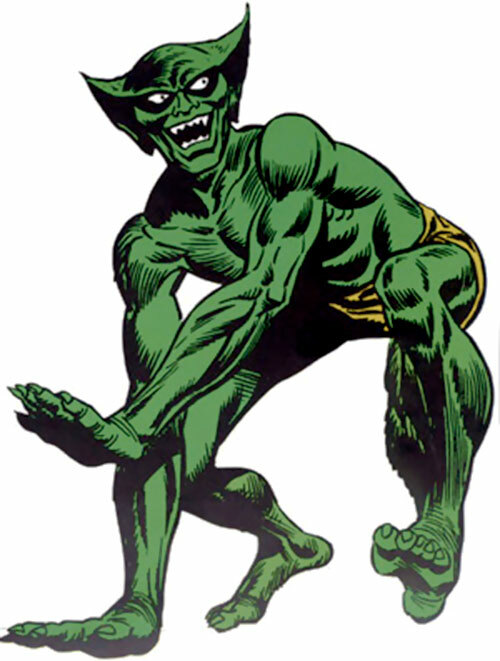 The Jackal was the baddie in an important 1974-1975 Spider-Man storyline. It brought us among other things the Punisher and Ben Reilly (plus, alas, the 1990s Clone Saga), among other things. His peculiar skills, his genius and his… distinctive look make him an interesting character. And several of us fondly remember him from our childhood comics reading. Real Name: Professor Miles Warren. Base Of Operations: Various Labs in NY, or cellar Labs of Empire State University. Professor Miles Warren was a true scientific genius, a master psychologist and a manipulator. He was a well-trained acrobat and fast, but wasn’t physically a match for Spider-Man. Jackal had performed a significant number of cloning experiments with varying degrees of success. He also could transplant memories, and could plant lasting hypnotic suggestions. He was capable of planning for years in advance, preparing plans that would carry themselves out even in his absence. While not physically a combatant, with planning, psychology, and by enlisting several allies he was able to overcome Spider-Man on numerous occasions. Of course, the Jackal was a cunning criminal strategist. Miles Warren was a biochemistry professor at the Empire State University who taught undergraduate student Peter Parker alias the Spider-Man, and Parker’s girlfriend Gwendolyn Stacy. Warren felt an admiration and affection for Stacy. As time passed, it became an obsession that Warren believed to be paternal in nature. 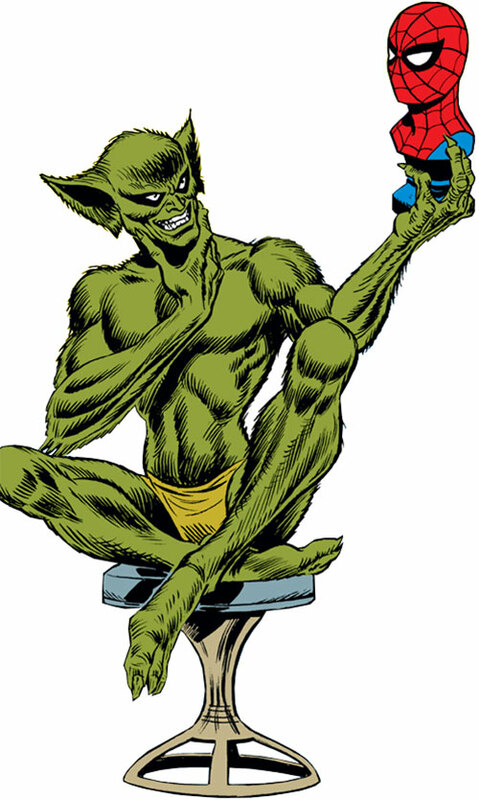 When Stacy died as a result of a conflict between Spider-Man and the original Green Goblin, Warren was grief-stricken. Warren believed the news media’s contentions that Spider-Man was responsible for Stacy’s demise. 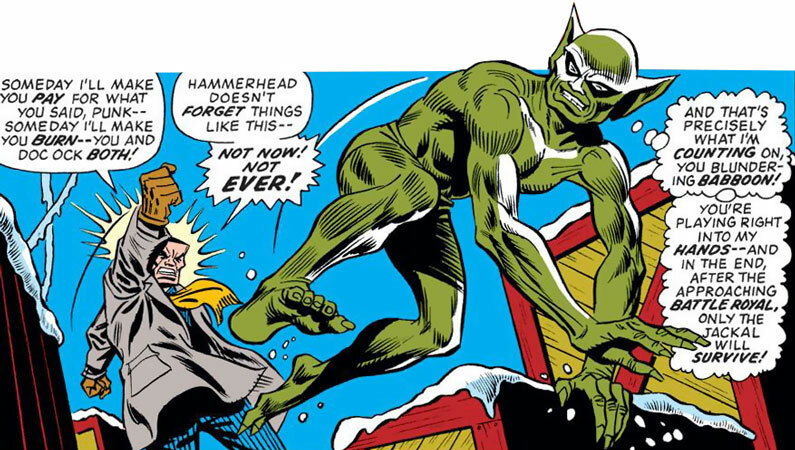 Spider-Man’s name was later cleared, and the Goblin was held responsible, but Warren continued to believe Spider-Man guilty. Before Stacy’s death, Warren had collected cell samples taken from members of her class. Now Warren surreptitiously used cell samples that had been taken from the bodies of Stacy and Parker to create clones of both. Four weeks later, Warren’s assistant, Anthony Serba, discovered that the clones were human. Alarmed, Serba insisted to Warren that the growing clones be destroyed. Warren, finally snapped, killed Serba on the spot and disposed of the body. Unable to face the fact that he had murdered Serba, the psychologically unstable Warren convinced himself that someone else must have done it. Overhearing a mention of the jackal, a predatory beast, while passing through a hallway, Warren decided that a person called the Jackal had killed Serba. Warren set about creating the identity of the Jackal, whom he believed was separate from himself. 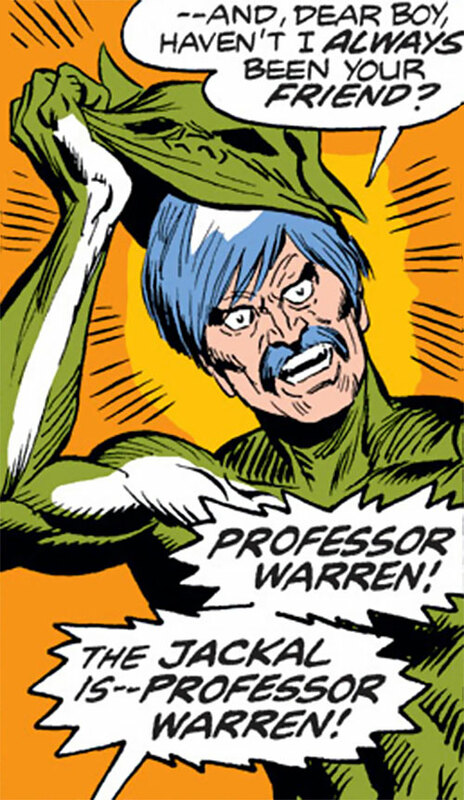 Warren planned to use his Jackal identity as his means of gaining vengeance on Spider-Man for the death of Gwen Stacy. When Warren learned that Spider-Man was Peter Parker, jealousy of Parker, who had loved Gwen Stacy when she was alive, compounded his hatred of Spider-Man. Warren trained himself athletically and designed a Jackal costume and weaponry for himself. Using special means, Warren rapidly aged the Stacy clone to the age that Stacy had been when she had died. The clone had Stacy’s memories, except for those covering the time shortly before and including her death. Warren gave the clone a posthypnotic command to obey him, and planned to use her as a psychological weapon in destroying Spider-Man. Beyond that, however, Warren was ecstatic that he had in a sense recreated the young woman he himself obsessively loved. The Jackal first attempted to destroy Spider-Man by manipulating the vigilante known as the Punisher, who thought that Spidey had murdered Norman Osborn. The Jackal convinced the Punisher that he, the Jackal, was dedicated to destroying the New York criminal underworld. Meanwhile the Jackal was fantasizing about taking over New York City. He attempted to set Spider-Man and the criminals Doctor Octopus and Hammerhead against one another, in the hopes that the three of them would destroy each other. Thus the Jackal would gain his revenge and eliminate 2 criminal rivals. Later, the Jackal formed an alliance with the Grizzly, a wrestler turned costumed criminal. He captured Parker, and affixed a homing device to his arm that would destroy it if tampered with. The Jackal claimed that he wanted Parker to lead him to Spider-Man. Parker freed himself of the device, and, as Spider-Man, defeated the Grizzly. Still later, Parker first met a clone of Gwen Stacy. Subsequently, the Jackal and his new ally, the Tarantula, captured Spider-Man. They brought him and the mesmerized Stacy clone atop the George Washington Bridge, from which the original Gwen Stacy had fallen to her death. The Tarantula pushed Spider-Man, who was bound in chains, off a support column of the bridge. But Spider-Man saved himself with his webbing. Shortly afterwards Spider-Man defeated the Tarantula at another location, but was recaptured by the Jackal, who revealed his true identity to him. The Jackal then escaped after challenging Spider-Man to meet him at midnight at Shea Stadium in Queens. At Shea Stadium the Jackal forced Spider-Man to battle a Spider-Man clone he had grown from cell samples taken from Peter Parker. Meanwhile, the Jackal held Parker’s friend Ned Leeds captive next to a bomb. …or so it was believed. The clone returned five years later as Ben Reilly alias the Scarlet Spider. Leeds, the Stacy clone and Spider-Man himself all survived. Years later it was found that Warren had also made several clones of Peter Parker and himself. Among these clones are Ben Reilly alias the Scarlet Spider, Kaine and Spidercide. Before leaving for his final battle, which happened to be two years after the original Gwen Stacy’s death, Warren initiated the process of growing a clone of himself, in case he should die in the coming combat. This clone, created in order to continue his vengeance, was left too long in the cloning tank since Warren had indeed died. Thus the clone died and came back as the nightmarish ghoul known as the Carrion. It has been speculated that it developed the first Carrion Virus in that tank, and which is the reason for his creation. But that’s probably not to be believed. Also it’s a more interesting plot if the Carrion was a deceased clone of Warren brought back by his hate to Spider-Man, as was originally stated. The Carrion gave Spider-Man much trouble in the early run of Spectacular Spider-Man. He died when his own creation, an amoeba clone of Spider-Man, killed him. Still, approximately five years later, another clone of Warren arose from the clone banks. This being was a genetically engineered clone of the original. The teeth and fur no longer a costume. 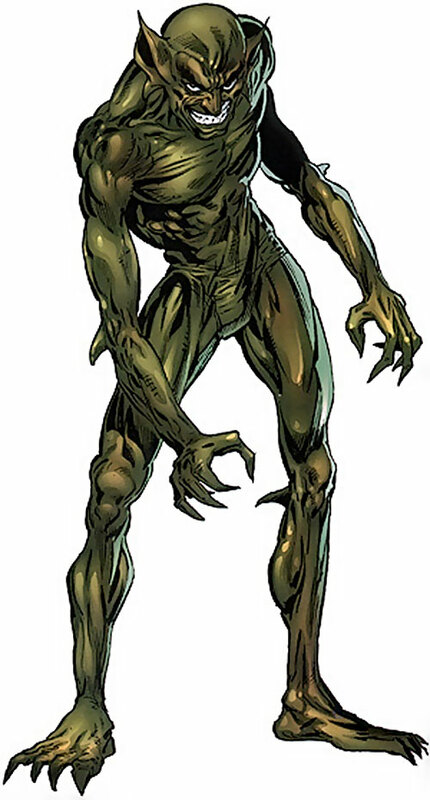 This new version of the Jackal was physically superior to Spider-Man. Following up on his old vengeance he gave Spider-Man extreme troubles, which he almost didn’t survive. The Jackal wore a tight-fitting olive green costume with a slightly furry appearance to it. Dr. Warren was remarkably well muscled. The outfit had razor-sharp claws which were typically tipped with some sort of drug. In his civilian identity Warren often wore fine shoes, brown trousers, a white shirt, a cross-checked, yellow coat and a dark tie along a pair of thick glasses. 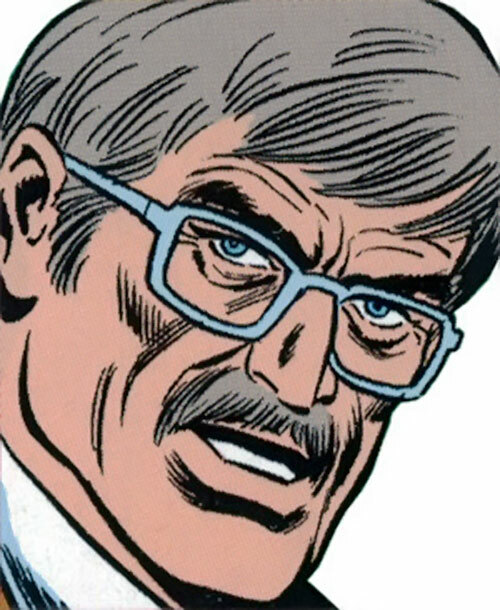 Professor Warren’s obsession with Gwen Stacy (which he himself mistook for paternal feelings) were the main driving force behind all his evil schemes. He found ecstasy in the sense that he had been able to bring Stacy back, and that he would also destroy her believed murderer, Spider-Man. The realization that Spider-Man was really Peter Parker, Gwen’s boyfriend and his student, filled him with jealousy. This further compounded his hatred for Spider-Man. Since Warren believed that his refuge identity, the Jackal, was somehow separate from him, he couldn’t be held accountable for anything that the Jackal did. Thus the Jackal became a fierce, lethal and cruel character. In planning, the Jackal is a very patient man. He can wait for years to realize his plans. He often used others as his pawns and stepped out of the shadows just at the end when he appeared to be reaching his goals. Apparently he enjoyed tormenting Parker/Spider-Man any way he could. He often broke out into long speeches of gloating when he thought his enemy to be helpless. Realizing Spider-Man to be physically superior to him, he always saw to it that Spider-Man was drugged and weakened when they confronted. Although his original goal was only the destruction of Spider-Man, he, eventually, came to the realization that he also wanted to take control of the New York underworld. Thus he tried to combine these two goals into his plans. He always prepared several back-up plans for eventual escapes, traps etc. He also set plans into motion that would bear themselves out even in the case of his own demise, like the creation of clones of himself (that could continue his work) and such. His plans were almost always flawless, except for one small detail: the realization that the Jackal and Professor Warren were one and the same. Consequently, in the end, when he was just about to win completely, his own mind betrayed him. He snapped out of his own madness and tried to atone for his sins by stopping his own victory. The Jackal’s life, goals and ambitions all circulate around Spider-Man. Due to the complexity of their relationship it’s easiest to keep Spider-Man as his main, and possibly only antagonist. Of course, it might be possible to change his antagonist into some carefree DC hero or a vigilante. Jackal’s manipulations makes him a worthy rival of Hugo Strange and the Joker. Thus he could be remade into a Batman foe, also fitting perfectly at home at Arkham Asylum. Genius, Gift of Gab, Lightning Reflexes, Scholar (Biology, Genetic Engineering, Induced Mutation, Psychology), Misc. Advantage (Since Prof Warren is the friend of Peter Parker he doesn’t activate Spider-Man’s Spidersense at all ; thus Spidey cannot sense him Blindsiding or Surprising ; additionally, since Spider-Man’s DEX is an effect of his Spidersense, Spider-Man uses an OV decreased by 2 CS whenever fighting the Jackal). Empire State University (High), Spider-Man Rogue Gallery (Low), Underworld (Low). Catastrophic Irrational Attraction (Destroying Spider-Man), Serious Irrational Attraction (Gwen Stacy), Serious Psychological Instability (Schizophrenic), Secret Identity. JACKAL COSTUME [BODY 02, Electricity Immunity: 05]. Metal Claws [BODY 08, Claws: 06, Lightning (touch only): 08, Poison Touch: 09, R#2]. I won’t even begin to describe this apparatus in stats and powers. Basically the proper user can create a clone, a genetically identical, full grown copy of anyone from a small cell sample. Apparently the clone possesses the memories of the original in suppressed form up to the time the sample was taken. Jackal can activate these memories so fully that the clone really believes himself to be the original character. The Jackal always implants memories in his clones (and captured victims) and often uses post-hypnotic suggestions, as well. These are activated by a situation or a spoken phrase to give rise to a certain programmed emotional response. These can be simulated by giving the victim an Irrational Attraction equal to a level set by the Jackal. The level is set by the number of HPs the Jackal spends on such attempts with 5 HPs for Minor, 25 HPs for Serious and 50 HPs for Catastrophic (these IAs can be bought off by the characters after activation). Often he lets clones believe that they are the originals and vice versa. The opposition for breaking against such programmed impulses is using the mental stats versus a set value of OV/RV 15 APs. The opposition for the original character to see through fake implanted memories may be even higher (meaning Jackal has spent HPs on his Psychiatry/Implant roll). The finished clones or even programmed originals can be made to change their Motivations, as well. 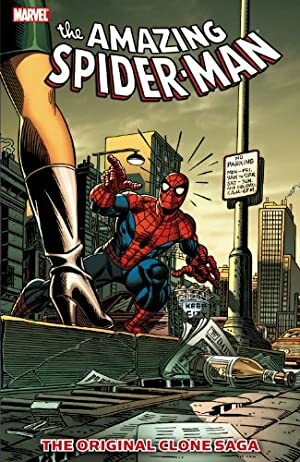 Source of Character: Spider-Man comics.